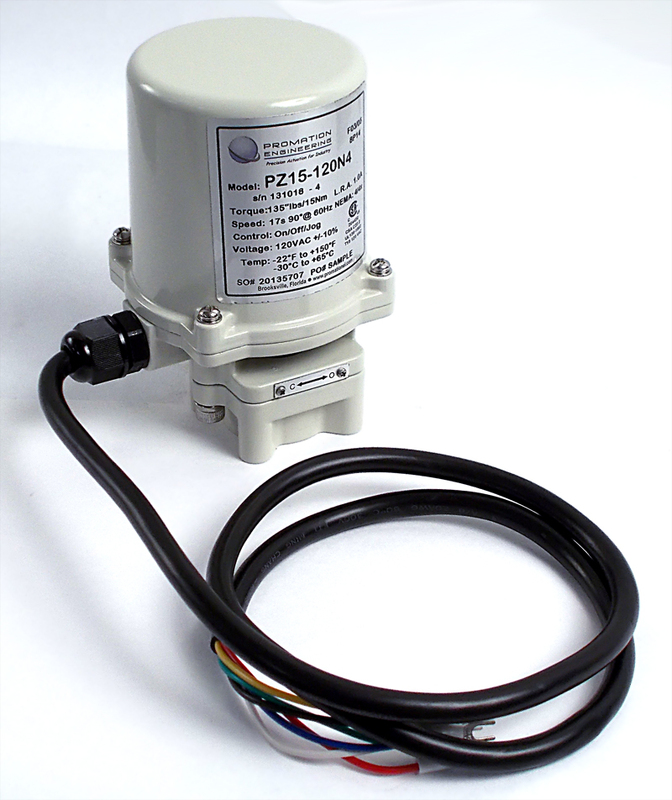 The PZ Series actuators have an overall volume coming in at 1 and 1.2 pints, (27.5 and 34.5 cubic inches) with heights of 5 and 6 inches for the 120VAC and 24VDC actuators, respectively. Rated for 45 and 135 in lbs torque with 8 and 19 seconds run time, the PZ6 and PZ15 actuators are ideal for small skid or OEM applications. The travel is set for 90 degrees and rarely needs to be changed from the factory settings. The single throw double pole end of travel switches provide hot electrical outputs that can be used to indicate position. The ISO 5211 FO3/05 mounting pattern and 14mm square drive output make mounting straightforward while a 1 meter cable simplifies field wiring. The on/off PZ6 and PZ15 are all metal construction with NEMA 4X/IP67 rating, ideal for outdoor use. The actuators have manual override capability that protects the process in case of a power outage. are available for this product. Please contact your sales representative for details.